Female hair loss, female balding (androgenic alopecia) or hair thinning in women (alopecia areata) is an increasing concern, and not just for women of a certain age. The latest statistics tell us that the percentage of women under the age of 50 experiencing hair loss is up by around 30% in the last ten years and women as young as 25 may be affected. Hair loss in women tends to be diffuse meaning that generally, the hair begins to become thinner in appearance all over the scalp and does not necessarily manifest in patches. Understandably, the fear for many women is that a noticeable degree of hair loss will inevitably lead to having to wear a wig every day to conceal it, which for many women, no matter their years, conjures up an ageing Mrs. Havisham-style image, enough to haunt anyone. However, these days there are far more options to combat hair loss, many of which are easily administered and which can bring natural-looking and permanent results. Hair transplant for women is rising in popularity and, along with men, women are increasingly opting for this successful and permanent hair restoration procedure. When does hair thinning in women become hair loss? Hair loss or hair thinning in women can occur for a number of reasons. The primary known reason is what’s called female pattern hair loss or alopecia androgenica. Throughout a woman’s life, hair loss will naturally occur due to fluctuating hormone levels (for example, post-pregnancy where hair is actually restored to its slightly thinner state pre-pregnancy). However, with alopecia androgenica, the condition is genetic and irreversible, leaving many women fearfully anticipating the inevitable and incurable. In other cases, the hair thinning or bald patches may be temporary and hair restoration need only be supported by a specialist lotion applied to the scalp. For permanent hair loss, hair transplant for women is one of the few options available and is often the best one. How does hair transplant for women work? 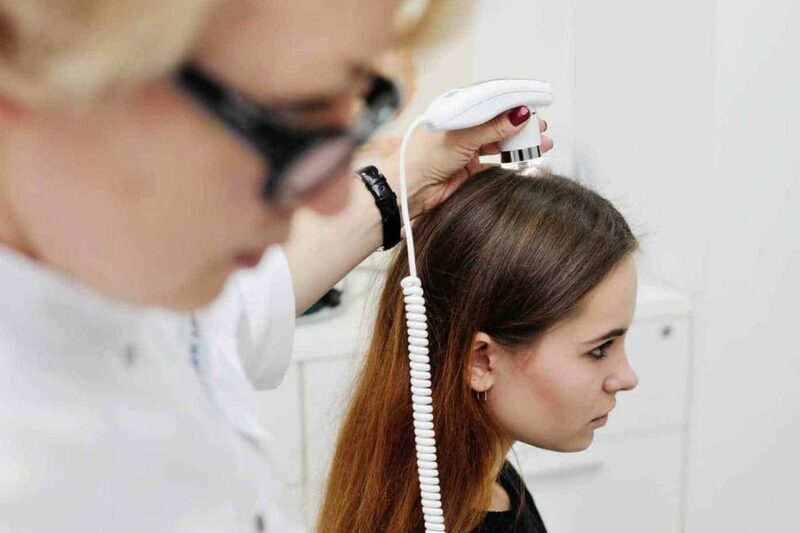 Following an initial consultation in which the hair loss can be assessed and eligibility for surgery confirmed, a hair transplant for women procedure (time length varying but usually around 5-10 hours) can be booked. An FUE hair transplant or ‘Follicular Unit Excision’ is where individual hair grafts are harvested directly from the donor area. A circular incision is made in the skin around the upper part of the follicle from a broad area of the back of the scalp. The location of the donor area is chosen to have long-term stability. It is then extracted (pulled) directly from the scalp. The hair tissue is then grafted finely and placed into the destination area, which is the final step in the female hair transplant process.